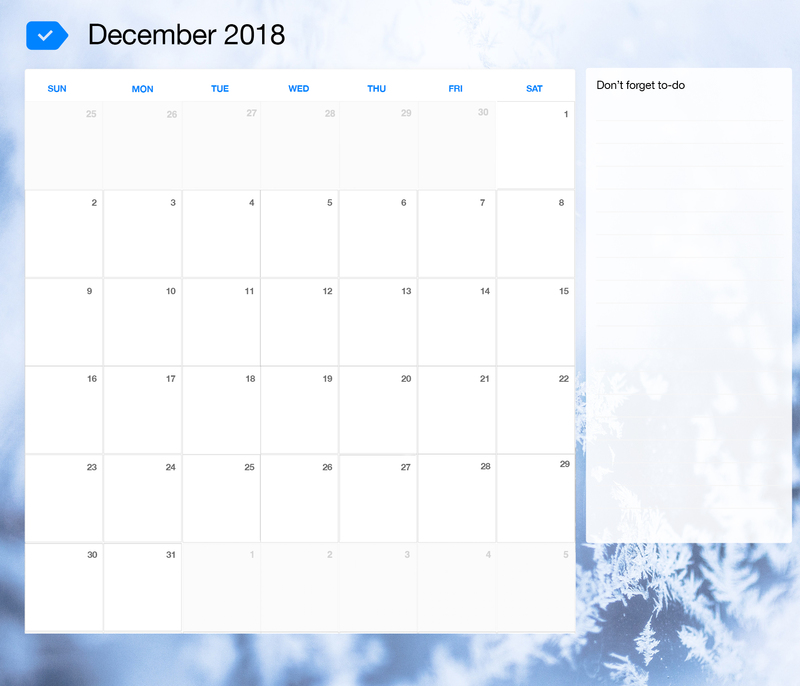 With the end of the year approaching and the holiday season just before us, December tends to be one of the toughest months to try and stick to a productive daily routine. In fact, most people prefer to wave their normal schedule altogether to get proper rest and enjoy this time with their family and friends. Although we completely support taking proper rest whenever you can; we believe that setting the foundation for an amazing new year should be done before January hits, ensuring you’re fully prepared to take on those New Year’s resolutions. 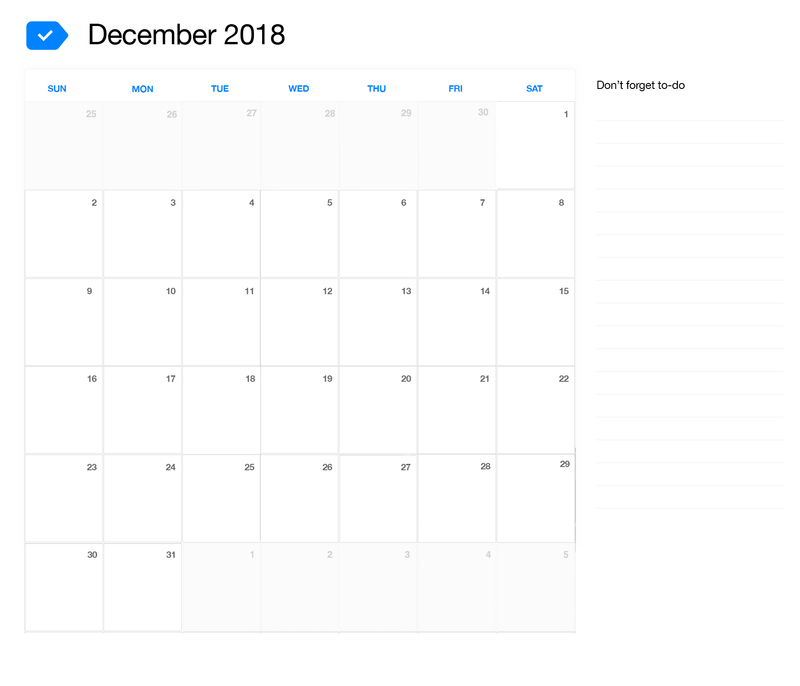 By using Any.do’s printable calendar for December 2018, planning your month in advance will be quick and easy – leaving plenty of time to spend with the ones you love. Don’t wait up until January 1st to figure out what you wish to accomplish in the year to come. Set yourself an afternoon or even an entire weekend to create your list of goals. Then, break them down to manageable action items that you’ll be able to execute throughout the year. Take this time to reflect on the passing year and what it brought to your life, so you know exactly what you’d like to improve starting 2019. Before the holidays put a halt to your work projects, make sure to seize this remaining time to review pending tasks with your colleagues, book important meetings and set follow up reminders for when you get back. If you’re working in the week between Christmas and New Year’s, this will be a great time to catch up on any backlog. Since staff is low and office space is much more quiet, it will be easier to focus better on your personal tasks during this period. Make arrangements to protect your personal time from being interrupted by outside distractions. Set your email to automatically send out-of-office replies, a day before you leave on your vacation. In most cases, emails sent to you when you’re away are hardly as urgent as you’d imagine. If you’re still worried about missing out, schedule specific time slots for checking your emails during your vacation so you limit your work time and avoid getting caught up in nonessential correspondence. If November’s discounts weren’t enough to get you through your Christmas shopping list, don’t wait till the last minute to get those done. Avoid the masses by penciling-in designated time to hit your favourite stores. Try online shopping to save time and make sure to schedule grocery shopping trips, so you have everything you need for your holiday recipes. Get yourself some ‘me’ time. Book yourself a relaxing spa appointment, massage or just a full day of laying in bed with your favourite book. Schedule fun events for you and your family or catch up with old friends. Make the most out of your vacation by spending it with the people you love, enjoying the activities that make you the happiest.